Informative 'Quick Start' menu for choosing the correct tool for the situation. Modified Black Scholes options model to value the options to delay, expand, or abandon investments. Automatic binomial 'tree' builder model to evaluate complex strategic options with multiple stages. Nash equilibrium Game Theory model to evaluate market entry strategies in a competitive environment. Ability to predefine historical investment and/or industry risk profiles to utilize across real options models. Compatible with all versions of Excel for Windows as well as Excel for Mac as a cross platform analytical business solution. More resources for the Real Option Valuation model including video, user manual and support can be found on the Excel Real Option Valuation Template page. I found the real options template by chance when reviewing price to expand and abandon. The features offered for the price are very good. The explanations for entry of data area also very good. I was impressed that the solution comes with Game Theory and the Binomial model too so recommend the real options template for Excel. I believe that based on using the real options template, the ease of expanding the branches in the binomial options tree, clear input boxes, and flexibility make this model applicable to non-producing oil and gas mineral properties pending proper input assumptions are used. The real options template is a very valuable tool. I have been using it for a while for my financial valuation and I liked it. 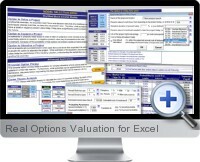 The real options valuation is very impressive work with Excel. It is very much like high dollar software but can be used with the already installed Microsoft Excel. We used this spreadsheet to justify a $30M software spend to a large professional services company. Specifically, we showed them the value of future expansion options if they went ahead with the said investment. This step was critical to closing the deal. I would highly recommend the Real Option Valuation spreadsheet to all financially savvy salespeople out there!